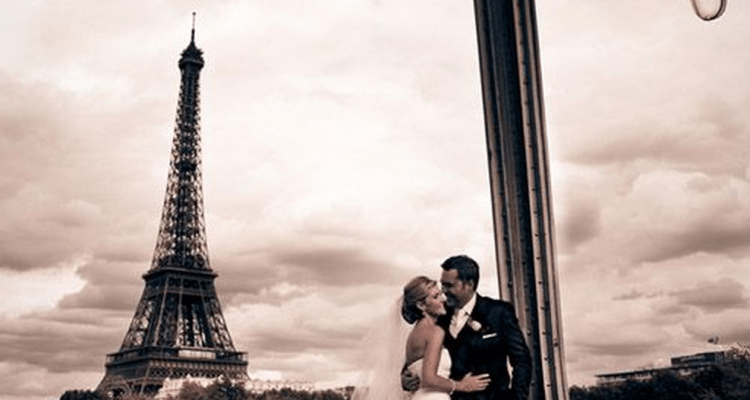 Plenty of couples have seen the charm in Paris-themed receptions over the past few years. You see them crop up in tastefully muted ballrooms, awash in lattes and mochas, blacks and ivories. 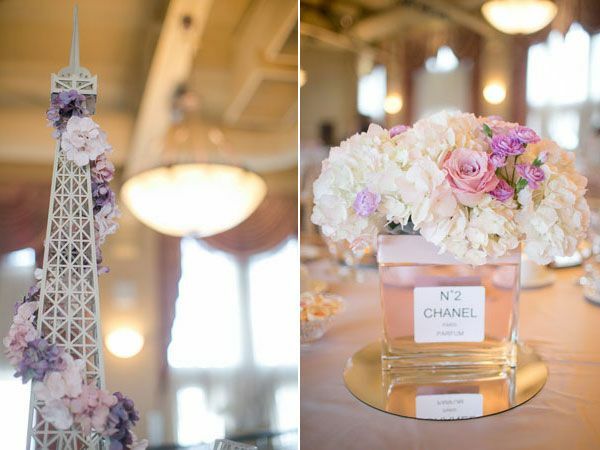 Couples spruce up the tables with eiffel-style vases, or actual mini Eiffel Towers topped with monochromatic florals. 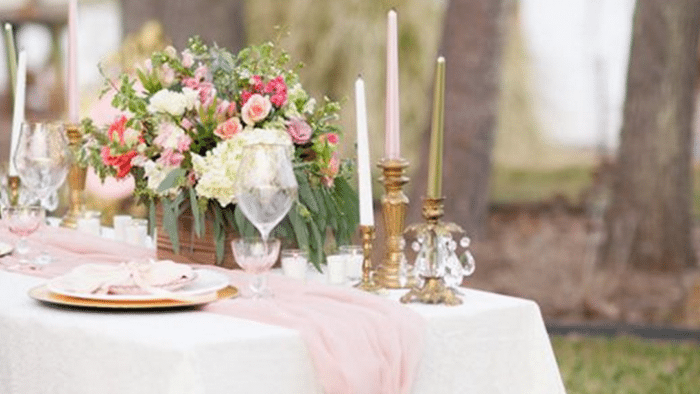 Sometimes you’ll see snippets of toile, a towering croquembouche on the cake table, bridal stationery peppered with fleurs de lis, or bridal showers that pop with pink-and-black hat boxes and velvety French-milled soaps. That’s why we tracked down New York wedding planner Sarah Lusardi of NY Engagements for her thoughts on the ultimate Paris-theme wedding. Because not only did Lusardi boast a stint at a stateside but “very authentic” patisserie (“we made our own baguettes and brioche in the back!”), she specializes in events with serious flair. In fact, Lusardi recently won an industry award for a Broadway-themed wedding that involved a host of professional actors (including the bride and groom! ), 300 guests, pro-level lighting and sound, and a budget — which took place on New Year’s, no less. So it’s no surprise that when we asked for her ideas of a memorable Paris-theme wedding, she quickly brought it back to the individual. “Even though it’s a theme wedding, it really depends on the couple … it’s a matter of bringing out their personality,” she said, pointing out that a Parisian-style wedding could fall into very different eras with very different moods, and styles of dress. What Color is Your Paris? The main question, she says, is what the individual couple wants to get out of it, based on their own personality and sense of style. “What is it about Paris that captured them? Is it the patisseries, the cafés? The street vendors with the crêpes and paintings, the watercolors? The Eiffel tower? “If you really liked to travel,” she adds, “you could focus on vintage-looking postcards with historical sites in France: Eiffel, Versailles, Notre Dame. Instead of a guestbook, you could put out these gorgeous postcards for guests to sign and then drop in airmail bags as a keepsake. Lusardi continues on with the cheese theme (a trend that’s so strong, some brides are replacing the traditional sponge-and-buttercream with wheels of Stilton and Camembert, stacked and tarted up for the occasion). “Pottery Barn has these attractive metal cheese markers. They’re engraved with the names of cheeses you’d see at a party, like chevre and cheddar. 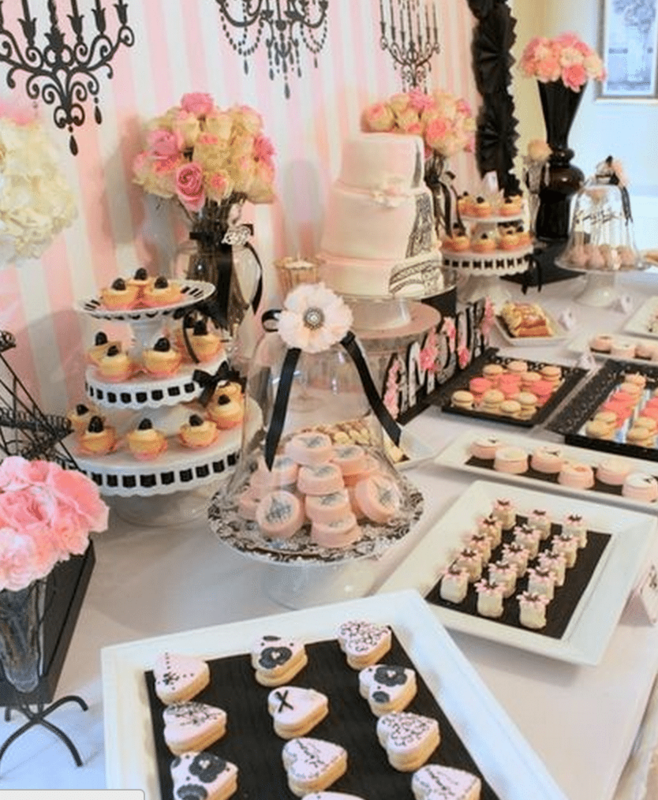 Or, for a treat that looks and feels very French: a dessert buffet, with tons of tiny pastries for guests to help themselves to, tucked in mixed and matched apothecary jars. And here’s another favor idea that’s sure to please: Valrhona chocolate bars, beloved among the French and chocolate connaisseurs alike. “I’d wrap them in a vintage lace or fabric,” says Lusardi. Of course, points out Lusardi, a given couple might be looking for more of a Moulin Rouge theme. 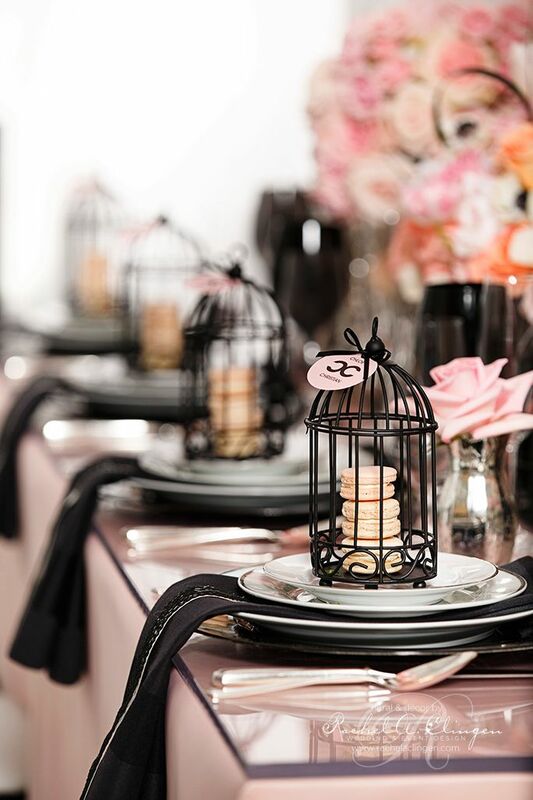 “This would be a couple who’s very fashion-forward and trendy — it’s quite a bit different from the Victorian-era French look.” It would call for more contemporary, modern centerpieces, she says: plume feathers, stark blacks and whites, glossy beads to fill glass containers. And if a couple really wanted to get into Moulin Rouge, she said, they could focus on fashion, choosing corseted bridesmaids dresses, for example. “The whole feel reminds me of Sophia Coppola’s Marie Antoinette,” she says. 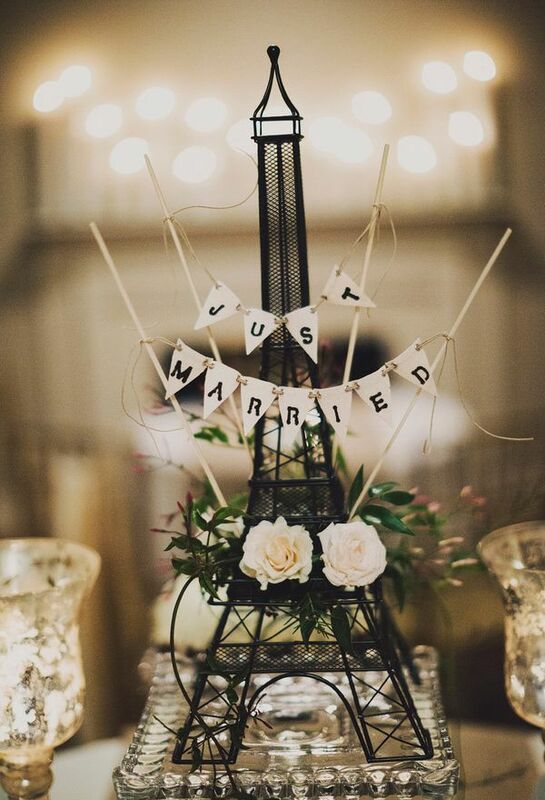 Thinking of bringing a little French flair to your own reception? Tell us your plans … or even what’s got you stumped.